Prince has a new palace and it's about six and a half hours due east of his old one. Today, the Detroit Tigers won the race for Prince Fielder with a nine year, $214 million contract. My analysis is after the jump. The Tigers were supposedly a late addition to the Fielder sweepstakes and this it's highly likely that their reasoning to get in the mix was with Victor Martinez likely to be out for most, if not all, of the 2012 season after suffering an ACL tear in his left knee during his workout. This now gives the Tigers a feared middle of their order and some protection for Miguel Cabrera now with Martinez out. A combo of Cabrera and Fielder is just nasty. The question is how will they be arranged in the field. Will Jim Leyland shift Miguel Cabrera back to third base, which he has not played regularly since 2007, and replace Brandon Inge, who hit a hearty .197 last season, or will one play first and the other be the DH. Note that the team was planning to have Cabrera play third if they made the World Series. It really is not that big of a deal in 2012 with Martinez out but when he returns in 2013 and with Alex Avila firmly entrenched behind the plate, it will be a major question. No wonder four days ago general manager Dave Dombrowski said that Fielder was "probably not a good fit" on the club. There are concerns of course with the Fielder signing. 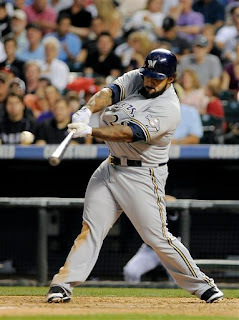 Fielder may not be able to play first a few years down the line and there are major concerns if he puts on too much weight on his 5'11'' frame. And if he is confined to be a designated hitter, who gives a DH $214 million. But for now, the Tigers' lineup is kickass, even without Martinez, and combined with a good starting rotation, featuring of course the best pitcher in the game in reigning AL MVP Justin Verlander, they are in my opinion the team to beat in the American League.